The Novel: An Anthology of Criticism and Theory 1900–2000 is a collection of the most influential writings on the theory of the novel from the twentieth century. Traces the rise of novel theory and the extension of its influence into other disciplines, especially social, cultural and political theory. Broad in scope, including sections on formalism; the Chicago School; structuralism and narratology; deconstruction; psychoanalysis; Marxism; social discourse; gender; post-colonialism; and more. Includes whole essays or chapters wherever possible. Headnotes introduce and link each piece, enabling readers to draw connections between different schools of thought. Encourages students to approach theoretical texts with confidence, applying the same skills they bring to literary texts. Includes a volume introduction, a selected bibliography, an index of topics and short author biographies to support study. Dorothy J. Hale is Associate Professor of English at the University of California, Berkeley. She is the author of Social Formalism: The Novel in Theory from Henry James to the Present (1998), which won the George and Barbara Perkins Prize given yearly by the Society for the Study of Narrative Literature for the best book published on narrative. Part I: Form and Function. 1 Victor Shklovsky, “Sterne’s Tristram Shandy”. 2 Vladimir Propp, from Morphology of the Folktale. 3 Henry James, Prefaces to the New York Edition. Preface to The Portrait of a Lady. 4 Percy Lubbock, from The Craft of Fiction. 5 Northrop Frye, from Anatomy of Criticism. “Rhetorical Criticism: Theory of Genres”. Part II: The Chicago School. 6 R. S. Crane, from “The Concept of Plot and the Plot of Tom Jones”. 7 Ralph W. Rader, “Richardson to Austen”. 8 Wayne C. Booth, from The Rhetoric of Fiction. Part III: Structuralism, Narratology, Deconstruction. 9 Tzvetan Todorov, from The Poetics of Prose. 10 Seymour Chatman, from Story and Discourse. “Discourse: Covert versus Overt Narrators”. 11 Roland Barthes, “The Reality Effect”. 12 Roland Barthes, “From Work to Text”. 13 J. Hillis Miller, from Reading Narrative. 14 Barbara Johnson, from A World of Difference. “Metaphor, Metonymy, and Voice in Their Eyes Were Watching God”. 15 René Girard, from Deceit, Desire, and the Novel. 16 Shoshana Felman, from “Turning the Screw of Interpretation”. “The Turns of the Story’s Frame: a Theory of Narrative”. 17 Peter Brooks, “ Freud’s Masterplot”. 18 Walter Benjamin, “The Storyteller”. 19 György Lukács, from Studies in European Realism. 20 György Lukács, “The Ideology of Modernism”. 21 Fredric Jameson, from The Political Unconscious. Part VI: The Novel as Social Discourse. 22 Ian Watt, from The Rise of the Novel. 23 M. M. Bakhtin, from “Discourse in the Novel”. 24 Henry Louis Gates, Jr., from The Signifying Monkey. “Zora Neale Hurston and the Speakerly Text”. 25 Jane Tompkins, from Sensational Designs. “Introduction: The Cultural Work of American Fiction”. 26 D. A. Miller, from The Novel and the Police. Part VII: Gender, Sexuality, and the Novel. 27 Virginia Woolf, “Women and Fiction”. 28 Eve Kosofsky Sedgwick, from Between Men. 29 Eve Kosofsky Sedgwick, “Queer Performativity: Henry James’s. The Art of the Novel”. 30 Nancy Armstrong, from Desire and Domestic Fiction. “The Politics of Domesticating Culture, Then and Now”. 31 Catherine Gallagher, from Nobody’s Story. Part VIII: Post-Colonialism and the Novel. 32 Gayatri Chakravorty Spivak, “Three Women’s Texts and a. 33 Edward W. Said, from Culture and Imperialism. 34 Homi K. Bhabha, from The Location of Culture. “DissemiNation: Time, Narrative, and the Margins of the. 35 Franco Moretti, from Atlas of the European Novel. 36 Wolfgang Iser, from The Implied Reader. “The Reader as a Component Part of the Realisti. 37 Nina Baym, from Novels, Readers, and Reviewers. “The Triumph of the Novel”. 38 Garrett Stewart, from Dear Reader. “In the Absence of Audience: Of Reading and Dread in Mary Shelley”. 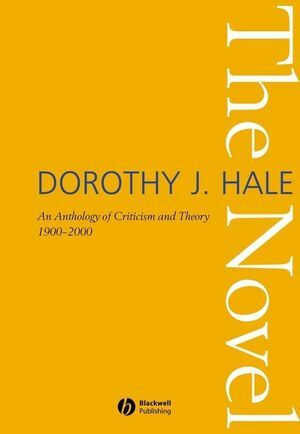 “Readers of Dorothy J. Hale's The Novel: An Anthology of Criticism and Theory 1900-2000 will find the volume to be two books in one. One book is the anthology proper, which brings together essays that theorize the complex nature and history of novelistic fiction. Those essays became classroom classics in colleges and universities during the last forty years of the 20th century. The second is a virtual book of its own comprised of Hale's brilliant introductions to the theoretical essays. Elaborating each of the essays, interweaving their significance and the significance of the schools of theory from which the essays derive, Hale's meditations are a supplemental bonus to all teachers and students with a taste for ‘novel theory.’ ” Robert L. Caserio, author of Plot, Story and the Novel and The Novel in England 1900-1950: History and Theory. An anthology of the most important writings on the theory of the novel from the twentieth century.